Styles change over time. Designers constantly create new designs and test new ideas, and the public often demands new innovative creations to keep them interested. Some styles change completely and abandon their original blueprints; however, many styles retain a semblance of their original patterns and designers add more features to modernize the style. Chandeliers have been around for centuries. They are a reminder of the styles from the old world and have remained a popular lighting accessory throughout the years. Some prefer the look that was treasured long ago and others desire a more modern chandelier for a more contemporary appearance. Candles were the source of light used for wooden chandeliers when they were first introduced in the 14th century. Their designs progressed into expensive ornate assemblies of crystals and candles as they became the popular rage for the wealthy, and a sign of elegance and class. They were also designed with metal and glass, and their intricate details made them a fashion statement as well as a functional ornament for lighting homes and churches. Although chandeliers were only attainable by the wealthy at that time, they have since become a more attainable fixture today, but they are still an expensive asset. Fortunately, Designer Chandeliers has managed to design chandeliers influenced by the styles of their past and modern chandelier designs of today for affordable prices. Chandeliers have often been duplicated with lower quality materials and designs to give customers the option of enjoying a chandelier in their homes without paying a high price. Although highly recognizable as a knock off to a quality chandelier, many purchased them in spite of their substandard look. Designer Chandeliers offers high quality chandeliers for reasonable prices without compromising quality or style choices. Their modern chandelier designs are unique and original, and will add the elegance and charm chandelier lovers admire. Their modern chandelier designs include acrylic tube chandeliers, dancing chandeliers, fish chandeliers, long nickel chandeliers, fork and spoon chandeliers, horn chandeliers, nickel stream chandeliers, spider chandeliers and much more. Customers are not limited in their design choices and can find a wide variety of modern chandeliers for every style and taste. Modern chandeliers build on the concepts of the past and play with new patterns and designs to create distinctive looks. Chandeliers are conversation pieces that often draw much attention from guests, and they create an atmosphere in a home that other lighting fixtures cannot achieve. 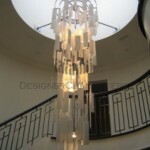 Visit http://www.affordablechandeliers.net/ to know more.